The bookmakers would have taken a bashing on Day Two of the Northumbria Open - if they’d been taking bets, that is - as all four favourites came through to reach the main tournament. What a day for a whitewash it was as three of the four came through with convincing 3-0 wins. 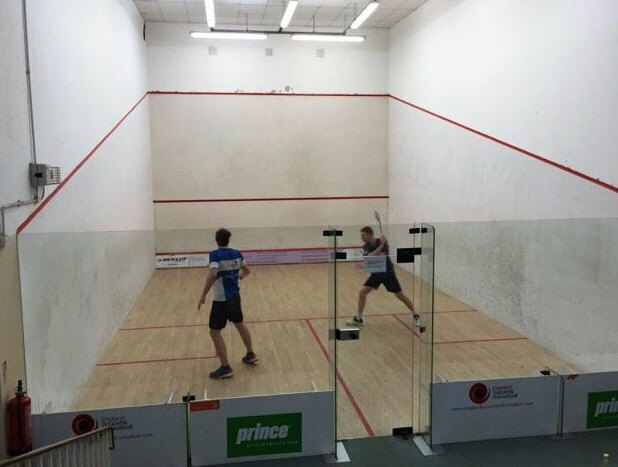 Welshman Emyr Evans - No 1 seed in the qualifying competition - was first to book his spot in the main section of this $5000 PSA tournament, clocking up a 3-0 victory over Kyle Finch which was a lot closer than the scoreline suggests. Evans had to work hard in a high-paced match, with the players’ similar hard-hitting, hard-running styles making for a high-class tussle. Finch, the England Under 19 No 1, had his share of moments but Evans - ranked 198 in the world - was a touch more attacking and he found the nick several times with some tight drops on his way to an impressive victory. Next up there was a big crowd for the Northumbria derby as the county’s top two players squared up against each other. Dave Barnett, on home turf at Jesmond went into the match slight favourite, and lived up to his billing as he edged into an early lead over Liam Gutcher in the first game. The county No 1 was rock solid, taking the ball early, and getting good length on his drives. Every more consistent as the match progressed, and looking hungry on every single point, he found his rival out-of-sorts on the night and he racked up a convincing 3-0 win. Austrian Jakob Dirnberger had the third highest ranking of the qualifiers, but he was given a tough task against England’s ever-improving Miles Jenkins. Bandana-ed and bearded, Dirnberger brought a touch of pirate glamour to the Northumberland Club, and his freestyle frenetic squash soon had Jenkins walking the plank (no apologies). Taking everything early, the Austrian never gave his opponent time to settle and he forced some uncharacteristic errors out of the 20-year-old on his way to competitive 3-0 win. Nightwatchmen Julian Tomlinson and Ben Coates went into late-night battle for the prized scraps of the last slot in the main event. Lancashire’s Tomlinson, No 2 seed in the qualifiying tournament, was the fancied winner here, but his odds lengthened when he lost close finishes in both of the opening two games - 11-9, 13-11. However Tomlinson - a losing finalist on his last PSA appearance in the North East - the Northern Open last October - was not finished yet. Known for his athletic style and consistent hitting, he noticeably upped the pace and increased the length of his shots, to quickly get back on level terms 11-3, 11-2. Surrey’s Coates was under more pressure now, and the clinical kills which had helped him carve out a 2-0 lead were turning into tins as the pace increased - Tomlinson (WR204) winning the decider to four, and book a main event draw against sixth-seed Ben Ford. Barnett earned a tie against England’s Michael Harris (WR176), while Emyr Evans drew second seed Joel Hinds and Dirnberger is pitted against 5 seed Joe Green. 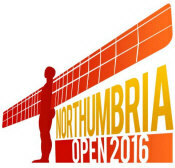 Two local heroes upset the odds to reach the qualifying finals of the Northumbria Open. Liam Gutcher of Northern and Dave Barnett, on home turf at Jesmond's Northumberland Club, both hit top form to see off Xavi Blanco and Elliott Selby (younger brother of former top 10 player Darryl) respectively. 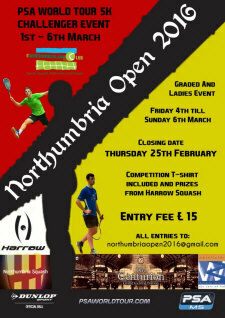 The top two players in Northumbria both won 3-0 and their prize is a clash against each other on Day Two. Elsewhere Tynemouth’s Sean Millington found Welshman Emyr Evans too strong, the top seed among the qualifiers, winning 3-0. Qualifying second seed Julian Tomlinson was given a challenge against Jamie Todd, who celebrated his 18th birthday by finding his form on the glassback, only to lose 3-0 - the second two going right to the wire at 11-9. If the birthday boy could learn to stop serving out after crash-nicking his opponent’s serve, he could have given Tomlinson a real scare. 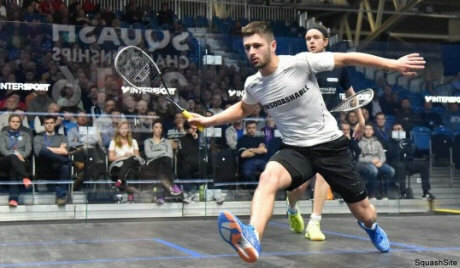 England youth international Kyle Finch prevailed 3-0 against Newcastle University’s super-fit Michael Collins, while Austrian Jakob Dirnberger also won 3-0, against Northern junior Sam Broughton. Arguably the tie of the first qualifying round was between Ben Coates and and local junior, Michael Mattimore. Surrey’s Coates edged the first 11-9 but the underdog hit back 12-10 to level. The third game was a real tussle until World No 195 Coates prevailed 14-12, and his consistent game held together from him to finish off a hard-fought 3-1 win. The Northumbria Open – now in its fifth year – attracts professionals from around the country and beyond – and with a prize fund worth $5000 (FIVE times last year’s total), the entry list is jam-packed with talent. 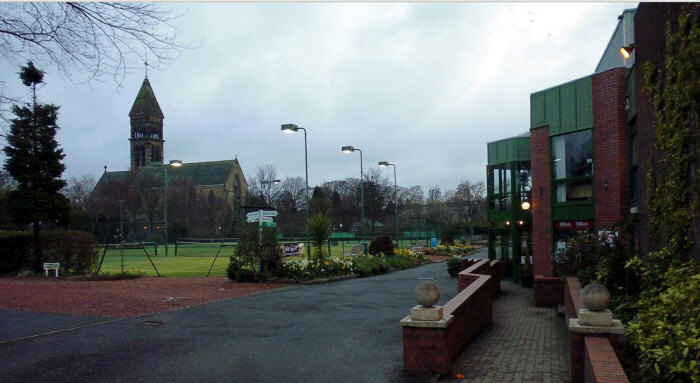 Sanctioned by the PSA there will be precious world ranking points up for grabs at Jesmond’s Northumberland Club between March 4 and March 6, in a tournament supported by main sponsor, North East financial services firm True Potential. 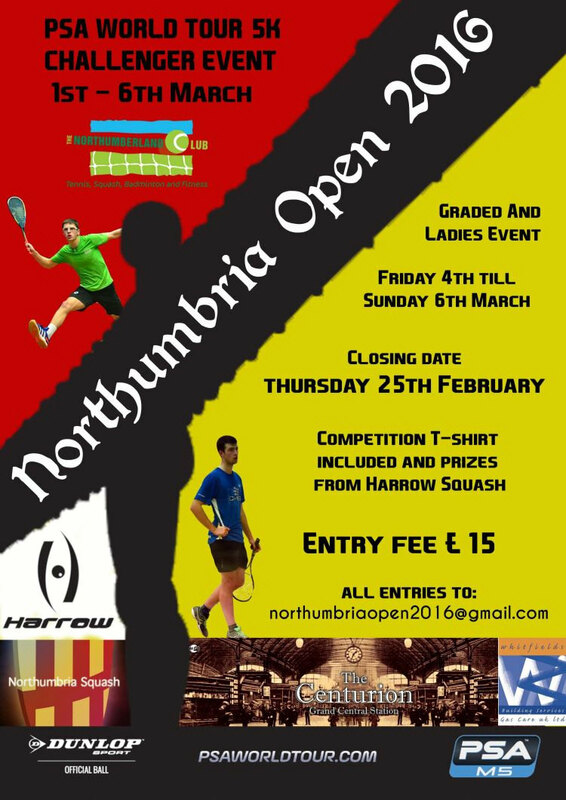 Entry is free so North East squash fans are in for a treat with no fewer than 11 top-200 players on display in the main draw. 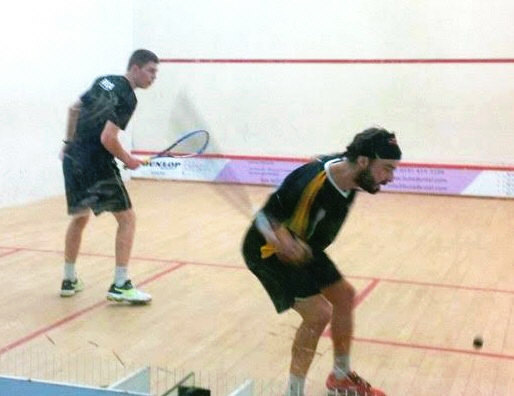 Top seed is former England Under 19 No 1 George Parker (World Ranking 78). 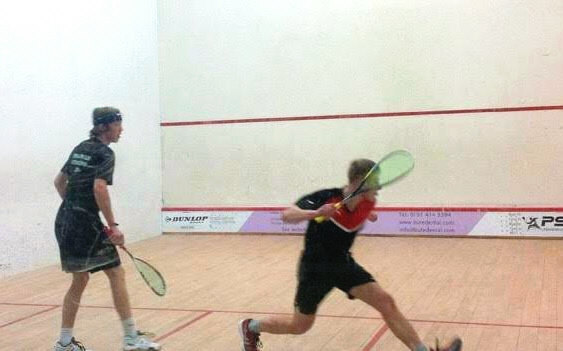 The Leicestershire firebrand – an England youth international – is starting to make a real impact on the senior tour, and recently took a game from former World No 1 James Willstrop at the National Championshps in Manchester. Reigning Northumbria Open champ Joel Hinds is two seed – the 28-year-old from Derbyshire is currently ranked 84 in the world and earned many fans with his upbeat approach and stylish play at Jesmond last year. Other players to watch out for are 22-year-old Scottish No 3 Dougie Kempsell, and upcoming English youngsters Joe Green and Patrick Rooney. International flavour is provided by Finnish world No 135 Jaakko Vahamaa and Tristan Eysele from South Africa. Flying the flag for the North East will be 13-time County Champion Dave Barnett, Tynemouth and Northern club champion Cai Younger, Liam Gutcher, Sean Millington, and stars of the region’s junior circuit Chris Wiggins, Jamie Todd, Michael Mattimore and Sam Broughton. 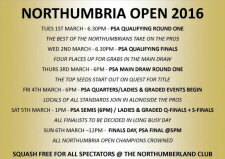 Main event qualifiers start on Tuesday March 1st, with the main tournament and the graded events for other North East players kicking off Friday March 4th.